View from the Beausite Park Hotel, Wengen. 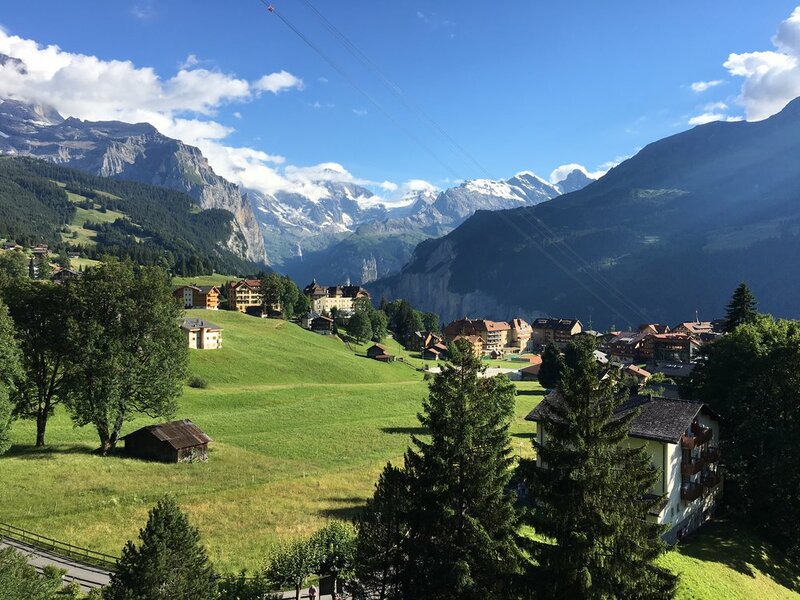 We spent a picture-perfect summer week in Wengen in the Bernese Oberland this summer. It's a magical car-free town with views of the Jungfrau, one of the highest mountains in Europe. Little Wengen, with its cute main street, wonderful restaurants, and mountain town clothing shops, is also home to one of my favorite hotels in Switzerland - the family-owned Beausite Park Hotel Wengen. You wake up to views of the valley and the Jungfrau, enjoy the most delicious breakfast buffet and dinners, fantastic coffee in the cozy lounge, live piano music at night in the bar, and true Swiss hospitality. I loved seeing all the American, British, and Swiss families gather at the dinner tables on their vacations. It's so, so lovely. A wonderful family-owned cheese shop, Chäs Gruebi in Wengen, that stocks lots of Alpenkäse (Alpine cheese) and Swiss wine. The essentials. The Chäs Gruebi shop in Wengen (on the way back to the Beausite Park Hotel). Dinner outside at Da Sina (behind the Hotel Schönegg) for pizza, pasta, and salad. It was such beautiful, cool weather and the light on the Jungfrau looked fiery and ablaze as the sun set. Eat on the patio if it's nice, but the inside is super cozy, too. Dinner outside at Da Sina. The Jungfrau ablaze near Da Sina. An Aperol Spritz on the terrace at the Hotel Caprice - stunning views, perfect weather! On the terrace at Hotel Caprice. Hiking from Männlichen to Kleine Scheidegg: a 1.5 hour walk, slow descent, doable for almost anyone. The fields of wildflowers (blooming in late June/July only), the rushing waterfalls cascading down from the glaciers, the views, THE AIR. You take the gondola from Wengen to Männlichen and then the trail is well-marked, like most trails in Switzerland. In Kleine Scheidegg, I loved eating at Restaurant Grindelwaldblick. You can either hike back to Wengen from Kleine Scheidegg or take the train down. En route from Männlichen to Kleine Scheidegg. A slice of homemade apricot cake at the restaurant at the Wengenalp train station - German/Austrian/Swiss baked goods are hands-down my favorite in the world. They're not as sweet (you won't find enormous cupcakes or brownies), there's a big focus on fruit (like the apricots), and they're often topped with a giant blob of lightly sweetened whipped cream. Lunch at Hotel Alpenruh in Mürren after hiking from Lauterbrunnen to Mürren (amazing views of the Jungfrau, Eiger, and Monch mountains). Take the quick tram from Lauterbrunnen (across from the train station) to Grütschalp and set off from there. It's mostly flat and really beautiful - you'll make friends with all the cows along the way. Best done on a day that isn't too hot - there isn't a lot of shade. Lunch at Hotel Alpenruh in Mürren. A note on trains: Not all mountain railways are included with your Swiss Travel Pass, a must if you're taking a lot of trains in Switzerland. Seat61 has a great overview of train options in Switzerland, but know that you will probably be shelling out extra for gondolas and other regional trains in the Bernese Oberland. We spent a good chunk of July in Switzerland and re-entry back to New York City has been harder than normal. I keep scrolling through photos like this one and my heart keeps constricting and spasm-ing a little bit. But I won't because I loved this place so, so much. Because our time and money is precious. I love discovering places in Switzerland that I never would have known about, had I not been traveling with Alex - like Melchsee-Frutt outside of Lucerne. This hotel, Guarda Val in the Swiss mountain town of Lenzerheide, is Alpine perfection. Split among eleven 300-year-old chalet-style huts, it's a place that will envelop you. The breakfast is divine, their main restaurant is one of the best in town, they serve coffee and cake every afternoon in a soaring space with a fireplace, there is a beautiful small spa and jacuzzi outside (which they call an "open-air hot pot" - haha). You wake up to heart-stopping views, you're breathing in air that can heal you, you realize you want a simpler life (or maybe that's just me). Most of all, I loved discovering Lenzerheide. I had been to Arosa - which is now connected to Lenzerheide by cable car, making it one of Switzerland's largest ski areas. But Lenzerheide is pretty special - it's really primarily Swiss people who go here. Tip: I'd highly recommend a car to get to Lenzerheide in the canton of Graubünden - it's that rare place in Switzerland not connected by train. But you will be rewarded. And maybe I'll see you there this summer.